1x2 Gaming is one of the leading online casino game software developers. The company is responsible for several unique and exciting games in the market including the traditional classic roulette. Astro Roulette was released at the beginning of 2016 but is still a favorite among many online table game lovers. If you are a follower of the twelve zodiac signs, then this Astrology theme classic roulette is the best game to try out. This variant of online roulette offers shorter odds than the standard European, French and American versions. Anyone with the knowledge of a standard game of roulette will know that there are either 37 or 38 pockets. 1x2 Gaming’s Astro Roulette variant completely defies this rule by offering players with a wheel of 13 sections; 12 pockets to represent the 12 signs of astrological zodiac and an additional smaller “infinity” pocket to represent the zero on an ordinary roulette table. This makes the board of Astro roulette to be more clustered than a normal version. The game also offers 12 inside bets which are represented by the zodiac symbols. Additionally, players can place split and corner bets between 2 and 4 spaces respectively. There are also outside bets which are represented by different zodiac signs grouped according to their relevance. That is regardless; they fall in the spring, summer, autumn and winter or represent fire, earth, air, or water elements and whether or not they are considered strengths or weaknesses. What’s more is that there is an option for placing 2/1 bets on four symbols that form a horizontal line on the board. The highest possible bet for the inside bets are 20 credits. In addition, the stakes on the seasonal or elemental outside wagers must not go over 60 credits. The bets on the horizontal rows cannot exceed 75 credits and bets on the positive or negative areas must be maintained at 100 credits. 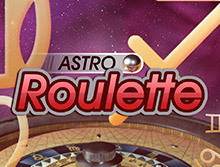 Astro Roulette allows a maximum table limit of 200 credits, which makes it a low limit online variant of roulette. If you are tired of the usual roulette wheel, try out Astro roulette which uses a unique futuristic theme and design. As aforementioned, the developer has replaced the normal numbering style with astrological signs. The game play is not only simple but fun and immersive as well. All the betting options (represented by four elements) are well placed at the bottom of the screen for quick accessibility. You will be able to increase or decrease your bet using the Positive and Negative options. The graphics used are stunningly beautiful and they match with the theme of the game. Other than the flawless game play and top notch graphics, Astro roulette has great sound effects which you will hear when placing bets and after clicking on the spin button. You will hear the dealer announce the winning astrology symbol by its specific win whenever there is a win and loss. The betting chips with different coin values are placed on the bottom right hand above the pink spin arrow button. Players will find this game rather more similar with 1x2 Gaming Chinese Roulette variant. With a theoretical return to player of 97.0%, the game guarantees numerous chances of huge wins. One thing to remember is that the casino always has the highest edge, which is why you may end up down because of un infinite rounds of spins. The 12 inside bets on the roulette wheel makes the game a perfect match for high roller players. The modern technology has made it possible for many online casino games to be compatible with major mobile phones. Astro Roulette is one of the latest version which is fully optimized with HTML5 technology to be played across devices like tablets and smartphones. 1x2 Gaming’s software is designed to fit on devices powered by Android and iOS. Whats exciting is that the can be played instant via major mobile browsers like Opera mini, Safari, Firefox and Chrome without the need to download a software. Play Astro Roulette anywhere for fun or for real money on your mobile device and enjoy a smooth and fast paced game play.